Murder by Gaslight: Murder Quickly Avenged. George Lear, an ex-prize fighter living in Altman, Colorado, had a bone to pick with Irene Good, a pretty barmaid at the Branch Saloon on Bull Mountain, Cripple Creek, Colorado. On November 15, 1893, Lear came to the door of the saloon and called for Irene. She went out and soon after, bartender Sam James heard her screaming. James ran outside and found that Lear had knocked Irene down and run away. Later, Lear came back and entered the rear door of the saloon, he went into the barroom and began shooting. Irene Good, who had come from behind the bar, fell to the floor and cried, “I am killed.” Sam James then emptied his revolver into George Lear. Though seriously wounded, Lear walked to where Irene was lying, shot her through the temple, then fell dead across her body. It is not clear what Irene Good had done to enrage George Lear. “Murder Quickly Avenged,” Muskegon Chronicle, November 17, 1893. 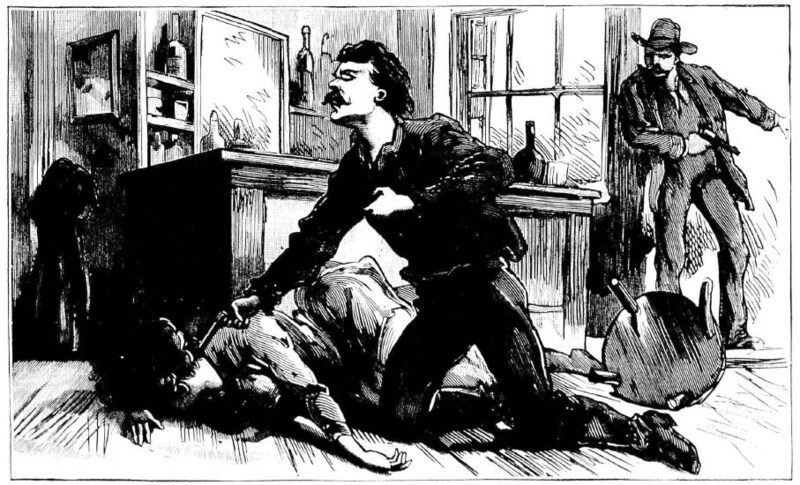 “A Pretty Barmaid Murdered,” National Police Gazette, December 9, 1893. May Irene Good rest in God's eternal peace...and may George Lear burn in a godless Hell for all eternity.